Santa Barbara on the right. From Colombia to Brooklyn. I’m back on the grid and in the grind and on the payroll and in the system. I’m no longer rogue and independent and only as traceable as the least reliable Colombian city bus. Now I’m putting my metrocard on a credit card and using a Verizon iPhone. I’m in a different world. And so is the coffee I spent months tracking. I could give general statements about how the coffee I saw as cherries on trees and sticky beans in basins of fermenting mucilage and encased in sweet crunchy parchment on drying patios has crossed enough thresholds that it is now part of a homogenized shelf-stocker caste along with everything else that lines up under grocery store lighting to die. But this venture is not about general statements and broad brushstrokes. It’s about those little specifics you don’t often get a chance to see or understand. So here are some specifics. One of the farms I visited in Colombia was Santa Barbara Estate in Santa Barbara, Antioquia. The estate is run by Pedro Echevarria, one of a long line of Pedro Echevarrias to export Colombian coffee. He and his family only recently started working their land intensely, because for years their cafetales were in regions too plagued by violence to be tended properly. There are countless stories wrapped up inside the Echevarria’s story, the story of the farm administrator who is like a part of their family and whose son now also works as part of the Santa Barbara dream team, the story of Jair the daily picker who has two children under the ages of 5 and has worked for Santa Barbara for years, or the story of how the employees of the different fincas within the estate compete in annual futbol games. There are lots of threads that weave a larger narrative of the coffee from Santa Barbara. I got to glimpse them and tug at a few. I touched the coffee trees, smelled the rotting pulp, got my shoes covered in the dirt, and shook hand after hand of Santa Barbara coffee people. I even learned that Pedro spent a few years attending a private high school in New Hampshire only a handful of miles from where I grew up. I don’t believe in 6 degrees of separation. I barely believe in 2. In a more or less “direct trade” model, small roasters in the US and beyond buy Santa Barbara’s coffee. One of those small roasting companies is Brooklyn Roasting Company. Brooklyn Roasting Company does a pretty impeccable job keeping their coffees organized. The roast bags of beans from close to 50 corners of the world, but you can be sure that when the can of beans or cup of joe you buy says “Santa Barbara,” the coffee inside is in fact from Santa Barbara. At Brooklyn Roasting’s facility you can see the stacked bags of green coffee lined up around the roaster, and watch them be pour into the hopper and transformed from green beans to roasted ones. Among those bags were a few from Santa Barbara. I wanted to cry and hug them. We hadn’t seen each other for almost a month, yet here we both were, sitting in Brooklyn Roasting Company. They had traveled by truck and by boat; I had traveled by bus and by plane. But we both made it. And I could look at that bag of coffee and tell you exactly who germinated the seeds, planted them, harvested them, processed them, and packaged them. I didn’t interview every Santa Barbara employee and I don’t know all their names, but I saw their faces and shook their hands. And their coffee made it to Brooklyn. 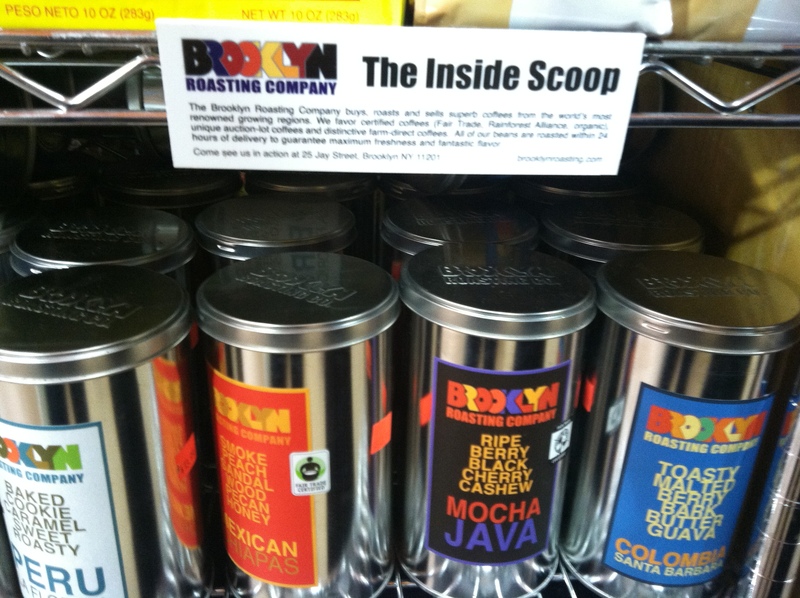 BRC roasts and packages coffee and sells it to restaurants, cafes, and retail outlets like grocery stores. One of the restaurants that buys BRC’s Colombian Santa Barbara coffee is the Landmarc Time Warner. If you go to brunch there and you order coffee, you will be drinking the work of all those people I met. 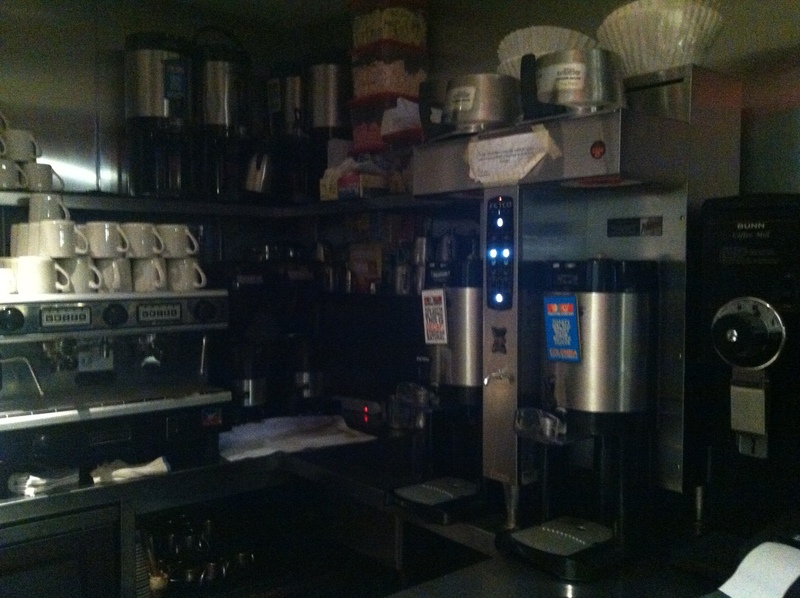 Landmarc’s coffee station. Note the Santa Barbara label on the server. How can I tell you that? I want to hover around the cushy booths with the sweeping views of Midtown and wait for a pair of brunchers to order coffee. I want to tell them what the seedlings looked like and how the Echevarrias built schools on their property and how Pedro’s grandmother died and left behind a peacock that hangs around the processing facility. I want to tell them about lots of coffee growing on small rolling hills, the ones miraculously growing in a dense jungle with way too much shade, and the ones on steep mountain “walls.” I want to tell them about the winding highways you have to take to get to the farm and the bulldog mutt that hovers wherever people are picking. I want to tell them every story that makes up the story of Santa Barbara coffee. But it doesn’t really work that way. It’s working a little differently because people are starting to think a little more about where their food and beverages come from, but we might still be missing the point. Identifying countries of origin for our coffees, and telling your barista “I’ll have the Ethiopian,” as casually as you’d tell your waiter, “I’ll have the Bordeaux,” doesn’t quite mean you know the story behind it, or the stories behind the story. There’s always more to the story, and I hardly even know the beginning. But stories get generic really quickly and hearing people talk about coffee often sounds empty. The hollow sound I hear from baristas- and some roasters who most aggressively brand themselves as being keepers of great stories- sounds a little bit more like a dangerous summary rather than a beginning for learning more.